Jack Butala: Welcome to the show today. 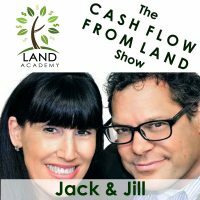 In this episode Jill and I talk about our offer campaign timeframe, the 30 day timeframe. So once that thing gets in the mail, what to expect almost day by day, I guess, for the first 30 days. Before we get into it, let’s take a question posted by one of our members on the Landinvestors.com online community. It’s free. Jill DeWit: Okay. Bradley asked, he said, “Hello Land Investors. I’m looking to make land investment, via data, a potential career. I was hoping I could find the answers to a few questions below. Thanks in advance. 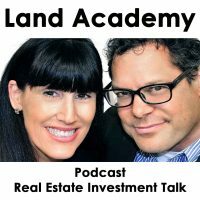 How much capital should I have to start, including the Land Academy cost and presumed mailing of 2,000 offers per month?” So one of our guys, this is really cool, already weighed in so I’m gonna read his reply here. Chaz replied, “Presuming capital isn’t an issue, how many should a total real estate novice send out, hold on a second, and how much learning should I do before sending out mailers if I want to start ASAP?” Well, the program should be enough to get started. With that, it’s hard to say how much learning’s enough, like the last show. Send one mailer of 1500 letters before making any decisions on monthly numbers. Jill DeWit: Depending on what your budget is, might be 50,000 to 100,000. Jill DeWit: On the mailers? Jack Butala: And plus with the Land Academy fees and the whole thing. Jack Butala: It’s less than that. [crosstalk 00:02:01]It’s probably closer to, I don’t know, 1000. Jack Butala: But, you know, you could get … there are people in the group and we get, you know 10, 15, 20 transactions out of one mailing campaign so … that keeps you busy for a long time if you’re new. Jack Butala: You know, you want to get ‘them sold and catch up so … A lot of people think that there’s a schedule. But here’s my point to this; a lot of people think it’s like a machine, so when you’re brand new, you don’t just sit and say, “I want to make a machine out of it. I’m going to send out 1500 mailers on the 3rd of every month. I’m gonna allocate $12,000 each month for acquisitions. I’m going to sell $24,000 each.” Bang, bang. It just doesn’t go that way. It does for us, quite honestly, now. But we’re what, 25 years into this. 20 years into it, so … Go ahead, Jill. Jack Butala: She just raised her hand like we were in school. Jack Butala: I kinda like it, makes me feel tingly. Jill DeWit: Thank you. Having said that … so … but … It is good to have schedule and push yourself though. I will say this, some of my real successful folks have really sat down and tasked themselves and stuck to their schedule. Like, alright, this week I will learn how to and pick a county. Next week, I will learn how to go in and download the data. Next week, I will learn how to do all this stuff and push and push and push and that’s not bad. Jack Butala: This is actually the show so I’m gonna say a few sentences. Jack Butala: I love your time frame thing so take that and then once it gets in the mail, I’ll take it from there about what you should expect for 30 days. Jill DeWit: With this county and downloading this data set and looking at it and knowing like, oh, okay, legal description, apn, acreage, zoning, owner name, owner address, situs address if there is one, all that stuff. I’m gonna learn what all this stuff is. Now, okay, so that’s, what am I on, week three? Week four. Now I’m gonna put this together with my mailer, I’m gonna get my data set and I’ve priced it. That was part of my get comfortable too. I kinda got that figured out, my pricing, making it a pretty mailer and get it to my printer to go out in the mail. Is this where you jump in, Jack? Jack Butala: Yep. So, and let’s say you used Offers to Owners, which is about to launch. So you get with our in house person to do your mail merge, you get it to lender stream effectively, it’s all correct and bang, you push the button. What happens, this is what the shows really about, what happens after those 30 days? I mean, and why do I choose 30 days instead of one week? Lender stream, it’s no accident that we came on Lender Stream, they’re now the number, I don’t know, probably the eighth mailing company that we’ve gone through over these years, and they truly are in the 21st century. Then, you’re gonna some letters signed, executed purchase agreements, back in the mail. And then around 8:30-ish, if it all goes relatively well, you and your seller, one, two or maybe ten, are gonna say “yeah, let’s do this deal.” And so at that point you can close the deal yourself, you can close it through title or use one of the tools we have available to help you get it done. So, this, I created this topic because a couple of people are kinda freaking out. We’ve had some people freak out, well we’ve had incredible celebration stories. Jill DeWit: Its kinda funny, yeah. Jack Butala: Celebration stories, but there’s just a couple where they just flip their lid. Jill DeWit: That’s really true, actually. Jack Butala: So it’s ironic that it’s called Fast Company, my gut reaction is when I get stuff like that, especially from you, Jill, is like to remedy it right away and even that it’s like oh no, I got it. Jill DeWit: Wait for it, give it minute. You know what, Jack? Its funny, I never thought about it but I sub-consciously do that anyway. I see peoples questions and I go “Do you really mean to ask me that?” Because if you sit back and reread your email, you’re not gonna ask this question. You’re gonna go oh, like you just said, sometimes they don’t even realize they just answered their question themselves in the question. Jack Butala: In the same article, they said 90% of the work, the days work gets done before noon. Jill DeWit: Oh, I totally believe that. Jill DeWit: ‘Cause after noon I’m in goof off mode. Jack Butala: Oh, me too. Jill DeWit: That’s coming up real quick. Jack Butala: Seven days a week actually. Jill DeWit: Sometimes before noon. Jack Butala: There’s a reason this show airs at three. Jack Butala: It’s closer to two now. Jack Butala: But that’s fine. Jill DeWit: Monday, Tuesday, Wednesday, look out. Thursday, Friday, eh, I don’t know. Jill DeWit: It’s gonna happen this Friday. Jack Butala: It’s an indicator that you’re happy with whatever happened that week. Jill DeWit: Do you know what’s funny? ‘Cause sometimes I do both. I do that and then sometimes I get involved in a project that I’m just so happy with that I just stay with it. I mean, you’ve seen me in my office and it’s getting dark and I’m just loving it. I’m on a project that I’m on a roll, I don’t want to stop. Jack Butala: Yeah, I mean, I’m doing some stuff right now that I’m love doing too. Which is content editing and video. We’re videoing the new programs that are coming out and writing a lot and those are the things that I love doing. Jack Butala: I hate to say this out loud but buying and selling real estate, because I’ve done it for what? Almost 25 years now? It’s not the first thing that I love to do anymore. But, it pays the bills. Jill DeWit: You know what’s funny? I still get excited about the transaction but I now get more excited about other people’s transactions than my own. Jack Butala: Me too. I like to see people’s successes. Jill DeWit: That’s it. When I hear so and so just made X amount of dollars, I’m like holy cow. Yay. That’s my motivation. Jack Butala: That’s why I created Landcrowdfund.com because we’re all gonna watch each other’s transactions now and help them along the way. Jill DeWit: There’s a lot. Have you looked at the back of Dealboard by the way? Jill DeWit: Recently? I was looking at it the other day, I’m like holy cow! Jack Butala: That’s gonna replace Dealboard and Crowdfund. Just post it out there and get it funded and get it sold. Jill DeWit: It’s huge. That little … You know what and that’s one of those that just kinda came along. We needed a way to share stuff. We needed a way to share deals. We just kinda came up with that real quick and then who knew it would be so great. Jack Butala: You know that’s a plug in, into a WordPress site and you’re right we slapped that together in like I don’t know, lets see if this works. Jill DeWit: Yeah, it’s awesome. Jack Butala: It’s really cool. Jill DeWit: It’s really good. Did we answer this okay? Jack Butala: Yeah, I think so. Jill DeWit: Okay. Good. Alright. Jack Butala: I nearly doubled my money. Jill DeWit: They’re like “Yeah, I did it all wrong but we all laughed about it, and I still bought it.” You know, kinda thing. It’s all good. Jack Butala: Join us for another episode where Jack and Jill discuss how to use information, that’s me. Jill DeWit: We use it every day to fill dead air and buy property for half of what it’s worth and sell it immediately. Jack Butala: This is the greatest excuse for me to get out of work, this show, that there ever was that I ever came up with. You’re not alone in your real estate ambition. Jill DeWit: And avoiding work. Jack Butala: What are you working on today? Jill DeWit: Right now. I don’t know. I honestly … [crosstalk 00:12:37] That’s a good question. Jill DeWit: Actually, the Offers to Owners stuff is what I’m working on. Jill DeWit: I don’t know what day it is. Jack Butala: Maybe we can just be done with work right after this, in like three minutes after this show is over. Jill DeWit: That would be bad. I vote that. Jack Butala: Nice. Information and inspiration to buy undervalued property.